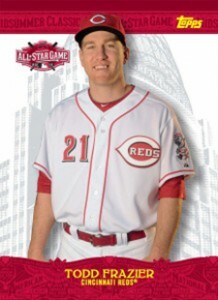 The 2015 Topps All-Star FanFest Baseball card lineup delves into today's stars, Reds legends and even a mascot. Available only at the events surrounding the unofficial midway point of the baseball season in Cincinnati between July 10 and 14. Those who bring a pack of Topps cards from 2015 (any brand) and open it at Topps' FanFest booth receive one of six different cards. Half of the wrapper redemption cards are Reds players: Todd Frazier, Joey Votto and Brandon Phillips. Also in the set are Clayton Kershaw, Mike Trout and Jose Abreu. There is a limit of one wrapper redemption card from each player per day. For fans of mascot cards, there will be a different one each day of the FanFest. 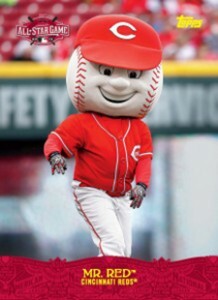 These showcase the history of Reds mascots. They're also available at the Topps booth. No purchase is required. Six different commemorative patch cards are being made for those who buy 2015 Topps Baseball complete sets at the event. Those who do make the purchase can pick one from a list of Reds greats that includes Johnny Bench, Barry Larkin, Joe Morgan and more. On Saturday, July 11, Topps is holding Rediscover Day. Collectors who bring in a Topps baseball card from 1999 and earlier get an exclusive relic card. All of the 2015 Topps All-Star FanFest Baseball cards are limited and available while supplies last. Besides these, the card maker is also hosting a booth where people can make their own baseball card. As well, sample packs of Bowman cards will be handed out at the 2015 All-Star Futures Game on Sunday, July 12. 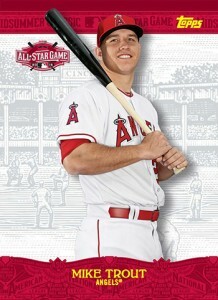 There will be several other exclusive collectibles available at the FanFest besides cards as well. The following is a tentative checklist. We'll add more specific info like card numbers when it's available. 6 cards. One given for purchasing a 2015 Topps Baseball complete set at FanFest.